These bench top extraction arms are useful for the removal of fumes, odour capture and vapour extraction when for example gluing or working with solvents. 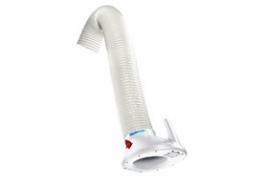 This is a flexible, cost-efficient and convenient solution for creating a fume-free workplace. 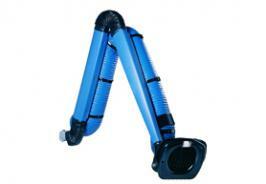 We specialise in various types of FX extraction arms for different industries. In some instances, the chemical resistant extraction arms will be used for highly corrosive chemicals, and the ESD/EX arms will be used for explosive ATEX environments because of their anti-static properties. All of these extraction arms come fitted with a damper that can be used to adjust the airflow required for fume and vapour extraction. These are easily maneuverable and robust, ideal for industrial use, particularly in FMCG, food, laboratory and pharmaceutical industries. 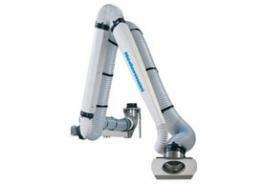 Nederman extraction arms can be used for many different applications. They are highly flexible and extremely simple to position, extend and retract. For improved efficiency and extra reach, these arms are supplied in different lengths and can be combined with a variety of accessories such as hoods or dampers. Suitable for most applications and industries, even corrosive and explosive industries, these extraction arms are used for what is known as “at source extraction”, which is a cost-effective and more efficient way to extract fumes, dust or vapours. Mobile dust collectors from Envirox include a range of portable dust collectors and their accessories, all of which are ideal for capturing and eliminating welding fumes and dust from your industrial or hygiene-sensitive workplace. A practical and cost-effective way to rapidly improve any workplace, mobile dust collector filter units contain everything you need to extract dust and fumes at their source. Available in many different sizes and capacities and whichever filter you choose, you will get the best of its kind at the highest quality. These mobile filter units are used in areas where space is limited and dust is not combustible. Some of these mobile dust collectors comes with an auto-cleaning function, which ensures a longer lifespan for your cartridges. These units can also be fitted with HEPA filtration for laboratory industries.